this mural creates an enchanting, stimulating yet relaxed Playroom space. 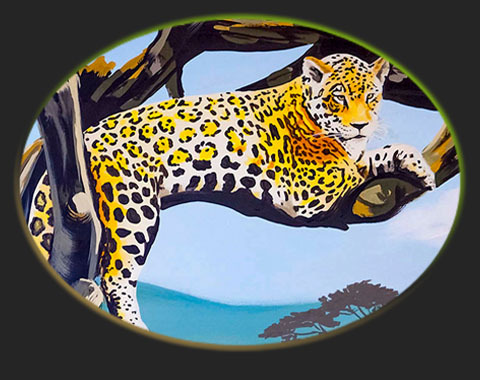 This mural was painted by hand, directly on to two large walls of a playroom. Estimates for Hand painted Murals like this one, painted on two large walls, would be in the region of say £3500, depending on the size and level of detail required. Of course you may qualify for a discount. Painted this sweeping Safari Mural in the playroom of a fantastic newly built house, built in a classic wooden beamed style. The idea was to create a stimulating yet calming environment with a design that was suitable for all ages and so last a whole childhood. The last photo below shows how the mural would look without the wall lamps, or the wooden beams, and I'm working on creating a wallpaper version. Safari Mural - Showing the right wall with a view looking down from up a hill, towards the Serengeti plains below, with cheetahs sitting on a rock, a jackal, giraffes, some birds and a majestic hot air balloon, which creates a connection with the human world. Cheetahs on a rock, one scans the serengeti plains below, while the other gets a good look at you! ...and this small change was asked for, to not include the big birds. The sketch for the right hand wall.